They Work Much Better in Their Whole State! 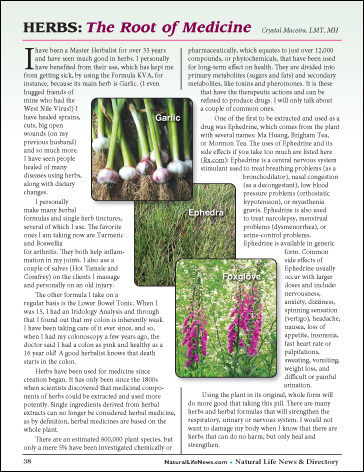 I have been a Master Herbalist for over 35 years and have seen much good in herbs. I personally have benefited from their use, which has kept me from getting sick, by using the Formula KVA, for instance, because its main herb is Garlic. (I even hugged friends of mine who had the West Nile Virus!) I have healed sprains, cuts, big open wounds (on my previous husband) and so much more. I have seen people healed of many diseases using herbs, along with dietary changes. I personally make many herbal formulas and single herb tinctures, several of which I use. The favorite ones I am taking now are Turmeric and Boswellia for arthritis. They both help inflammation in my joints. I also use a couple of salves (Hot Tamale and Comfrey) on the clients I massage and personally on an old injury.